This is one of those salads that is way, way more than the sum of its parts. It doesn't look like much, but the roasted sweet potatoes, tangy dressing, bright collards, creamy cheese, and crunchy cashews combine to make something altogether magical. (Rob and I texted each other at lunch time about this one - it was that delicious!) I hope you like it as much as we did! Roast the sweet potatoes: preheat the oven to 450 degrees Fahrenheit. Combine the sweet potatoes, 1 tbsp olive oil, cumin seeds, thyme, and salt and pepper to taste. Roast until the sweet potatoes are tender and golden brown, 20-30 minutes. Cool. 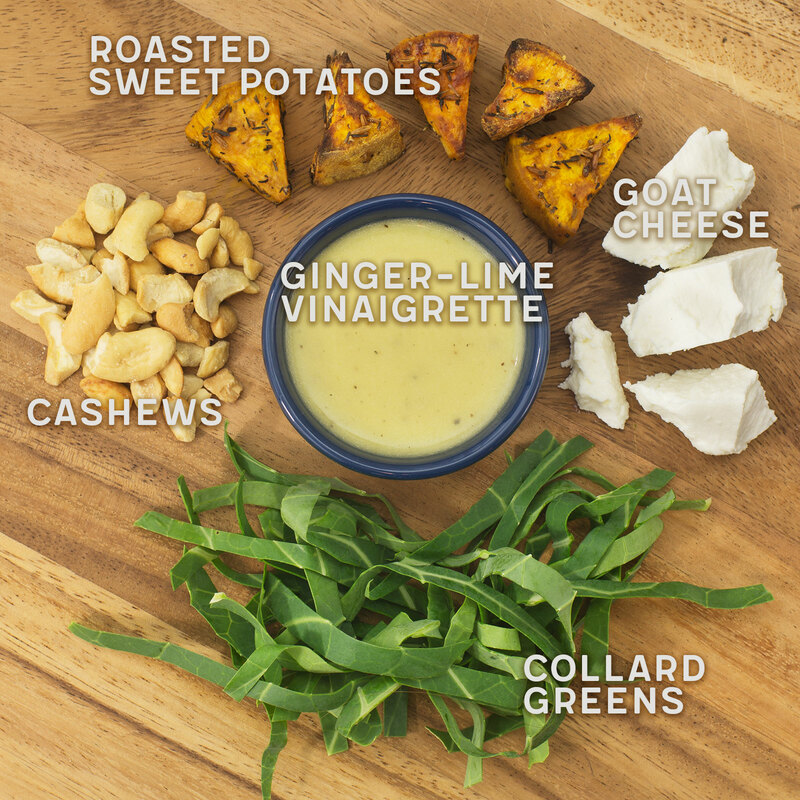 Pack the salads: divide the vinaigrette evenly among 4 tall quart-sized containers. 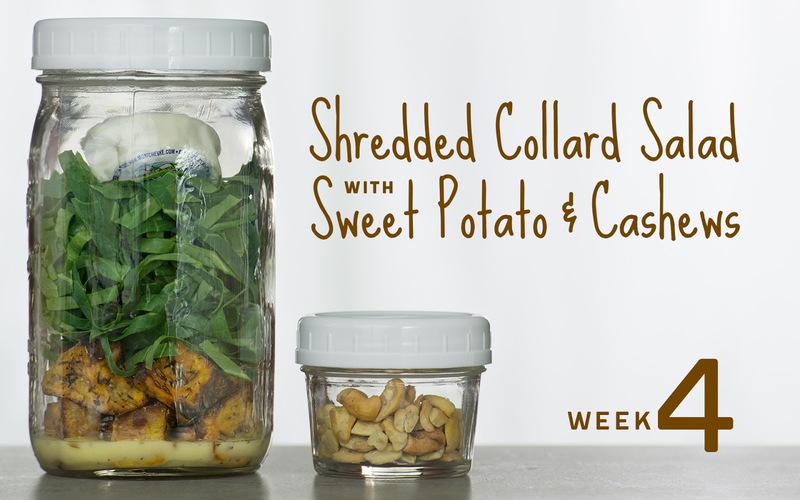 Layer the sweet potato and collard greens in the jars. Add 1 round goat cheese to each jar. Divide the cashews evenly among 4 2-ounce jars or snack-size zip-top bags for each salad. Refrigerate until serving. Enjoy your salad: invert your salad onto a plate or into a bowl. Top with goat cheese and cashews. TIME-SAVING TIPS: Substitute bottled lime juice for the fresh lime juice. Substitute pre-washed, bagged collards or baby kale for the shredded collards. SPECIAL DIET SWAPS: This salad is vegetarian and gluten-free as-is. For a vegan option, omit the goat cheese, or substitute a homemade or store-bought vegan goat cheese for the dairy cheese. Substitute unsalted sunflower seeds for the cashews to accommodate tree nut allergies.